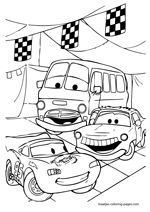 Cars takes place in a world populated by anthropomorphic transportation. 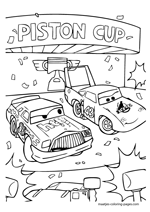 The film begins with the last race of the Piston Cup championship, which ends in a three-way tie between retiring veteran Strip "The King" Weathers, infamous runner-up Chick Hicks, and rookie Lightning McQueen. 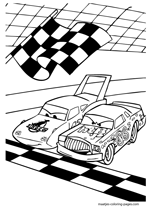 The tiebreaker race is scheduled for one week later at the fictional Los Angeles International Speedway in California. 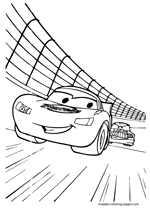 Lightning is desperate to win the race, since it would allow him to leave the unglamorous sponsorship of Rust-Eze, a rust treatment for old cars, and allow him to take The King's place as the sponsored car of the lucrative Dinoco team. 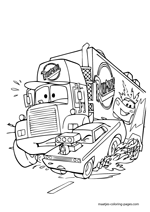 Eager to start practice in California as soon as possible, Lightning pushes his big rig, Mack, to travel all night long. 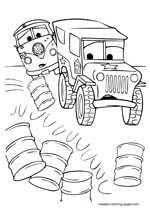 While McQueen is sleeping, the exhausted Mack drifts off and is startled by a gang of reckless street racers, causing McQueen to fall out the back of the truck into the road. 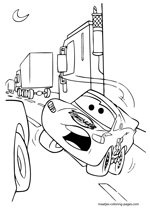 McQueen wakes in the middle of traffic, and speeds off the highway to find Mack, ending up in a run-down town of Radiator Springs and inadvertently ruining the pavement of its main road. 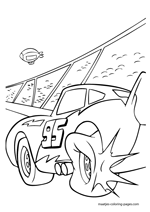 After being arrested and impounded overnight, McQueen is ordered by the town's judge and doctor, Doc Hudson, to leave town immediately. 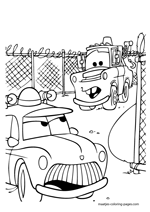 The local lawyer, Sally Carrera, insists that McQueen be given community service to repave the road, to which Doc begrudingly agrees. McQueen tries to repave it in a single day, but it turns out to be shoddy and McQueen is ordered to repave the road again, which takes several days to complete. 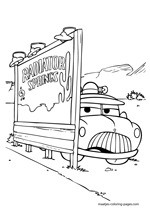 During this time, he becomes friends with several of the cars, and learns that Radiator Springs used to be a popular stopover along U.S. Route 66, but with the construction of Interstate 40 bypassing the town, it was effectively taken off the map. 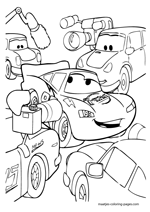 McQueen also discovers that Doc is really the "Fabulous Hudson Hornet", a three-time Piston Cup winner who was forced out of racing after an accident and quickly forgotten by the sport. 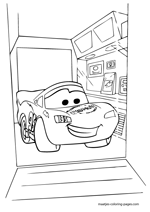 McQueen finishes the road, which has invigorated the cars to improve their town, and spends an extra day in town with his new friends, before Mack and the media descend on the town, led by a tip to McQueen's location. McQueen reluctantly leaves with the media to get to California in time for the race, while Sally chastises Doc after discovering that he had tipped off the media to McQueen's whereabouts, not wanting to be discovered himself instead.